We went away for a week and came home to monster raspberry plants, rampaging cucumbers, tomatoes heaving with fruit and two very vociferous cats (don’t worry, they had been well cared for by my dad). There are also many fallen leaves (boo) and so many cobwebs that you have to walk along the paths waving your arms in front of you. The raspberry canes have shot up and there appear to be plenty of autumn raspberries still to come (yay). 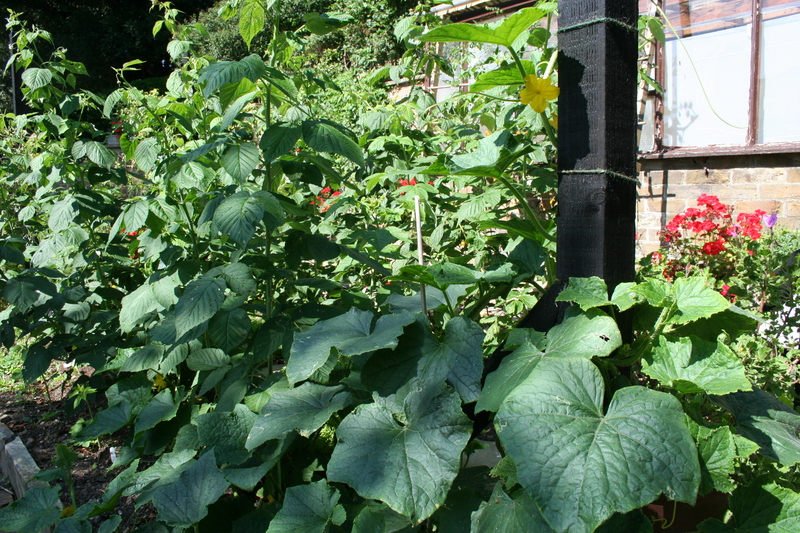 That’s a cucumber in the foreground – an outdoor variety called ‘Marketmore’ and I can vouch for its easy-going nature, vigorous habit and delicious cucumbers. The greenhouse tomatoes – ‘Sungold’ and ‘Gardener’s Delight’ – are prolific. The four tomato plants outdoors are thriving too. They’re not quite as tall as these, but they are cropping well. We’ve already had loads for salads and general munching, and I made a tomato tart for dinner this evening. I may even make chutney. 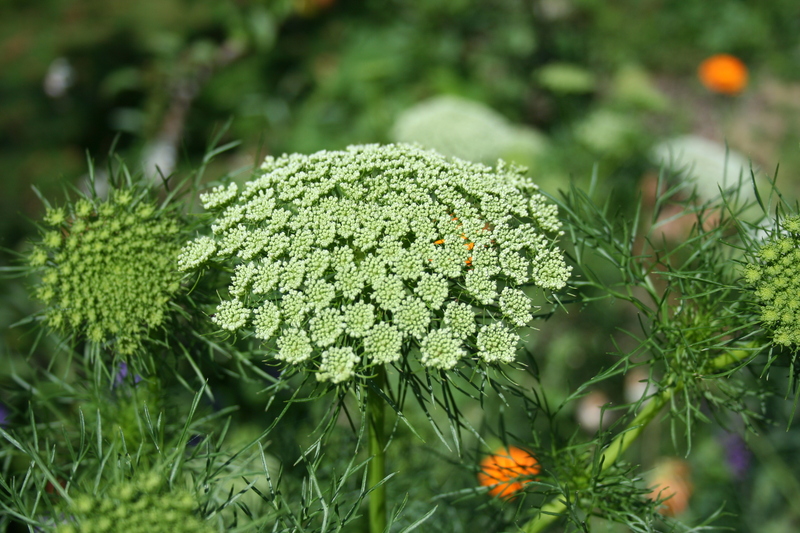 I planted out our Ammi majus much later than advised (I think it was in mid-July) but happily they are now starting to flower and will hopefully continue into September. 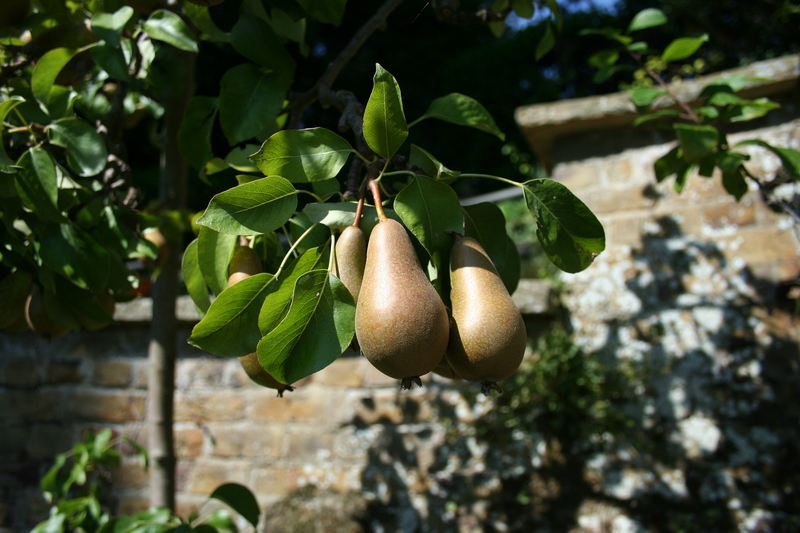 The pears, plums and apples have all done well this year and the branches are heavy with fruit. The Tithonias are still going strong. I’m so chuffed with these flowers and will definitely plant them again. They are great cut flowers, as well as looking fabulous in the garden. This is one of about 10 plants, so we have had a lot of flowers. 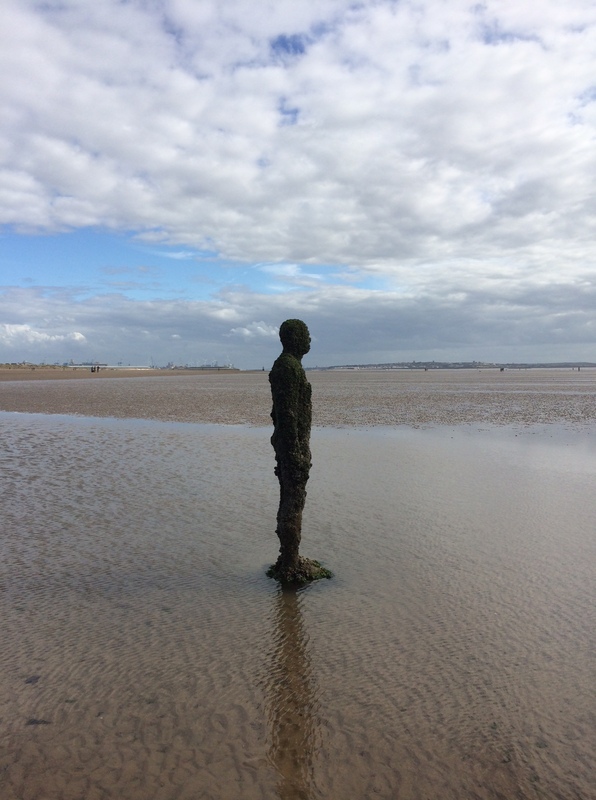 While we were in the north-west, we visited Crosby Beach to see Antony Gormley’s Another Place. It is made up of 100 cast-iron, life-size men (definitely men) looking out to sea, spread along the shore. They emerge from the sea as the tide goes out, which is quite eerie, but they have a calm, serene presence. Most of the figures are now covered in sea plants – nature is softening these hard, man-made sculptures. 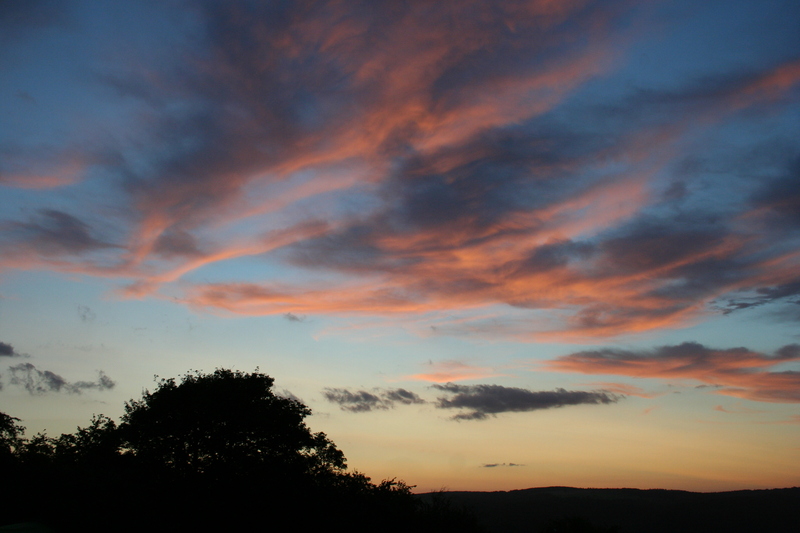 … and a few nights of camping in the completely gorgeous Wye Valley just north of Chepstow on the English/Welsh border. We found a lovely, relaxed campsite with beautiful views and had a very happy few days. My middle child happily absorbed in whittling a stick by the campfire. I can’t tell you how delighted I was to see him doing this as he usually spends far too long looking at screens. Boy, stick, knife, fire = happy. And we toasted marshmallows! Over the campfire! What you can’t see is that we were wearing nearly all the clothes we’d brought with us. I completely underestimated how COLD it would get at night. 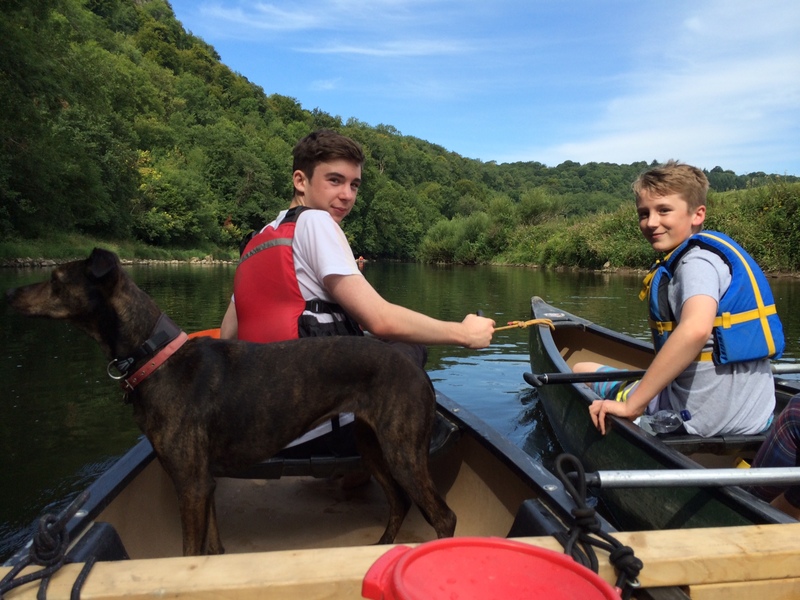 One of the best ways to see the River Wye is on it, so we hired canoes for a day and paddled a 15-mile stretch (including the rapids at Symonds Yat). After being decidedly unsure about the whole thing, our dog Cassie soon realised it gave her a much better view of the local wildlife, especially squirrels on the bank. Glorious sunsets, sitting around the campfire watching the stars appear in the sky, away from all the distractions of home. Of course we had the usual teenage strops, tutting and rolling eyes, but on the whole this was the perfect way to reconnect and recharge our batteries. Autumn is definitely just around the corner, waiting impatiently. But it will have to wait a little longer as today has been one of those absolutely peachy, idyllic late summer days. It’s been hot – the car display said 30 degrees which is hot here – so we loaded our kayak onto the roof rack and headed down to the beach for the afternoon to make the most of this perfect August Saturday. I am ignoring the forecast for cool, wet weather next week… I hope that you are having a fabulous weekend too. That hazy strip of land in the distance is France. The blobs in the sky are from my grubby lens (the darker one is a seagull). I have yet to take a photograph that does the view justice. I’m sure it would involve a different, better lens and more photography knowledge than I possess. Sam, you make the world seem a more delicious and fascinating place everytime I read your blog and look at your gorgeous photos. Thank you for bringing a little bit of sunshine in to my life. Gosh, thank you Lina. What a lovely thing to say. What a lovely post, thank you. I think next year we may try and follow your planting timings – you have the touch. Thank you Luise. 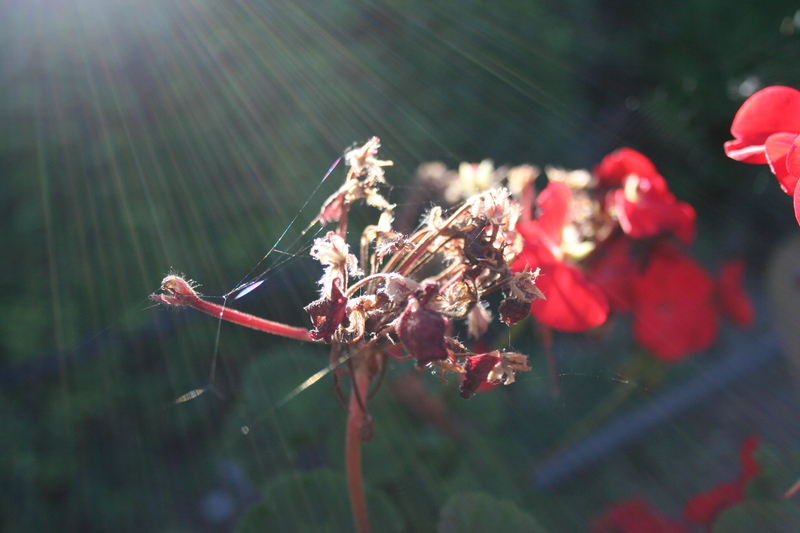 I think most plants are very forgiving and tough enough to withstand a little off-kilter care. It’s all trial and error though. 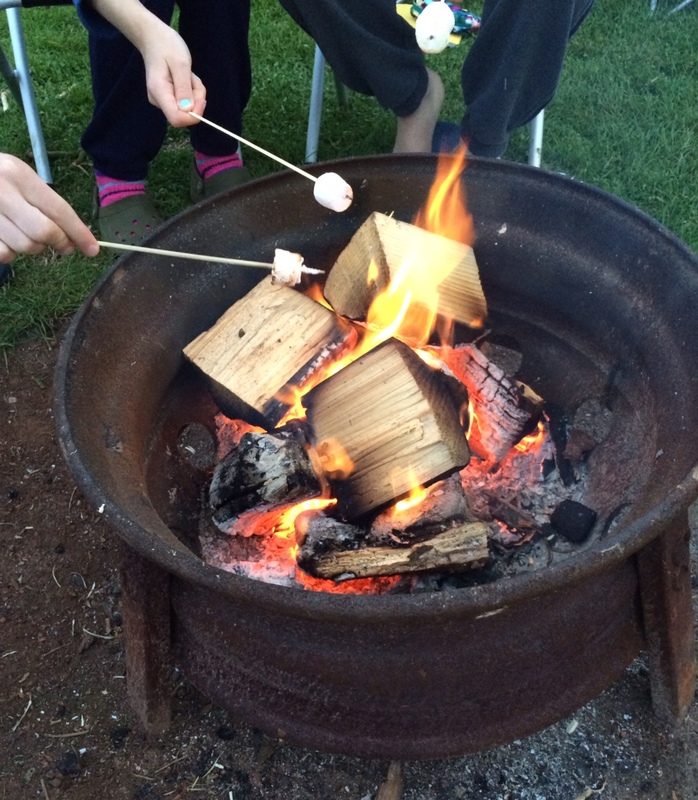 I’ve loved reading this slightly longer post, especially about your camping holiday. I used to go to that area when my son was still a teenager. (We went to Whitemead where there were cabins and apartments if we didn’t fancy sleeping under canvas that year.) I remember the cold of August nights in a tent! I’m a firm believer in separating kids from their tech at least once a year; my son also used to totally get into just enjoying being outdoors. I always wished it would continue when we got home; sadly, no. Your garden is looking really good too and I’m fascinated by those Antony Gormley sculptures, something I’d like to see! Thank you Caro. The nights were very cold and I did sleep in all my clothes! Great fun, though. Needless to say, my sons are both firmly glued to their devices once more, although the younger one has just played cricket for six hours so I’ll let him off. The Antony Gormley sculptures are definitely worth seeing if you’re ever up that way. I loved seeing an update of all the things going on lately. Your garden looks fantastic. I would love to have lots of raspberries and I always wish for more tomatoes. Kayaking looks like a lot of fun, as does camping. I’m glad you’ve had a nice time. Thanks Jennifer. Camping is great fun when it’s dry. Not so much fun in the rain. Looks like you’ve been having wonderful holidays. The river Wye is gorgeous, I’ve spent many a happy day rowing there. Hope you enjoy the next week and a bit and we have a few more sunny days (we were on the north Kent coast yesterday, at our new favourite Oare Marsh and gosh it was hot despite the sea breeze) before school starts. Lovely produce too, it’s been a good growing year I think and the rain came at just the right time for the autumn raspberries. Ooh, I’ll have to check out Oare Marsh. I’ve not been there. I hate leaving the garden in summer for any extended period of time, but yours looks good. Isn’t Tithonia a fantastic plant? My favorite annual. We also had some happy camping trips with our kids when they were younger. Do they make smores in the UK? You take a toasted marshmellow and squish it with a piece of chocolate between two pieces of graham cracker. I love coming home after a holiday and seeing how the garden has changed. 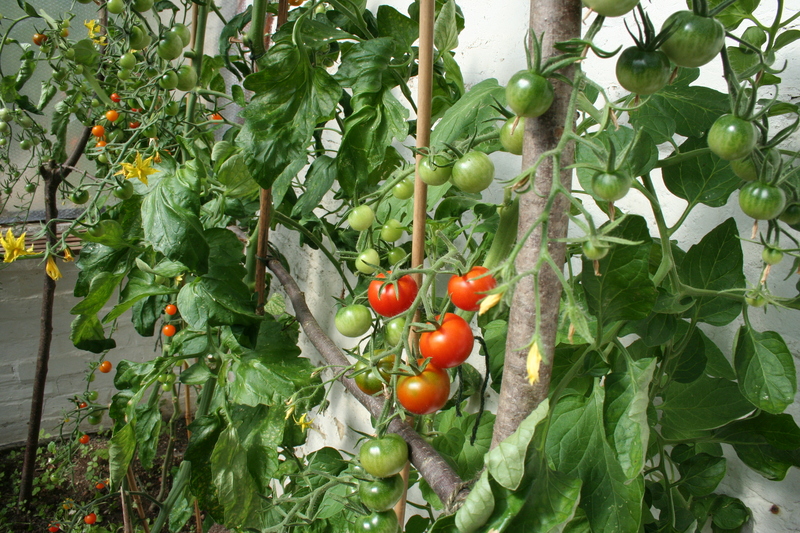 Yours looks very productive, I like the idea of home grown tomatoes but we’ve no plans for a greenhouse – yet! It is amazing how quickly everything changes, which you don’t notice when you see it every day. I was a bit put out that there were so many fallen leaves though. It does feel very autumnal today. That looks a pretty idyllic break, especially the camp fires and canoeing. Your last photo seemed to be filled with blobs and marks, but then I realised it was my grubby computer screen! It looked so much better once I’d cleaned it. 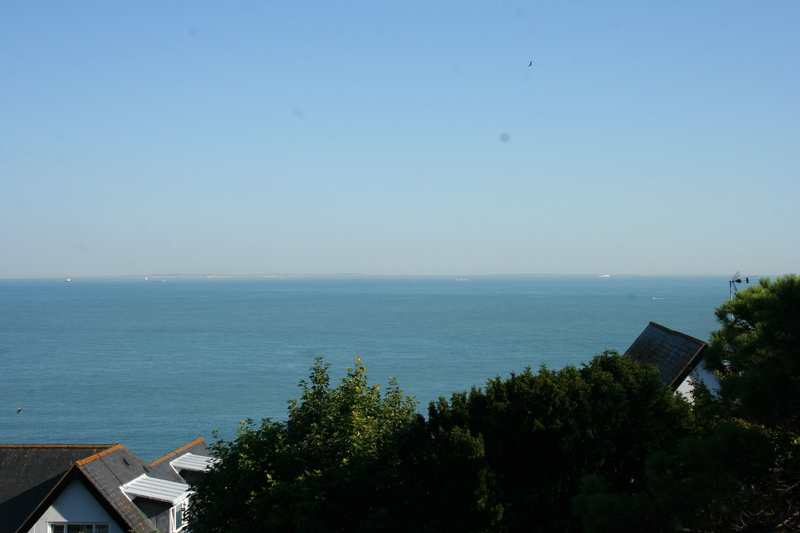 How wonderful to be able to look across to France. Ha ha, Anne, yes, my screen is v grubby too. I must clean that lens… Sometimes France is so clear it looks close enough to swim to (if I was a super sea-swimmer, that is). 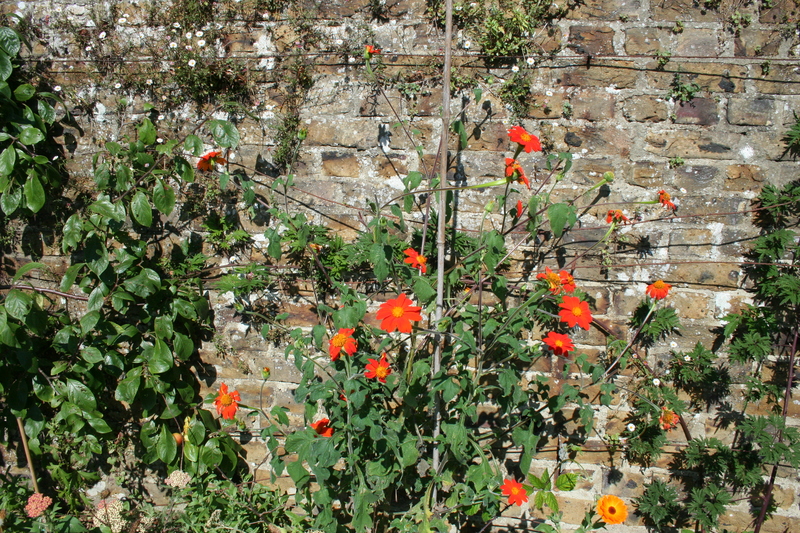 I got the Tithonia seeds from Sarah Raven and sowed them in March. They took a while to get going after I planted them out but they’re definitely making up for it now. The colour is amazing. What a great holiday post, thanks. 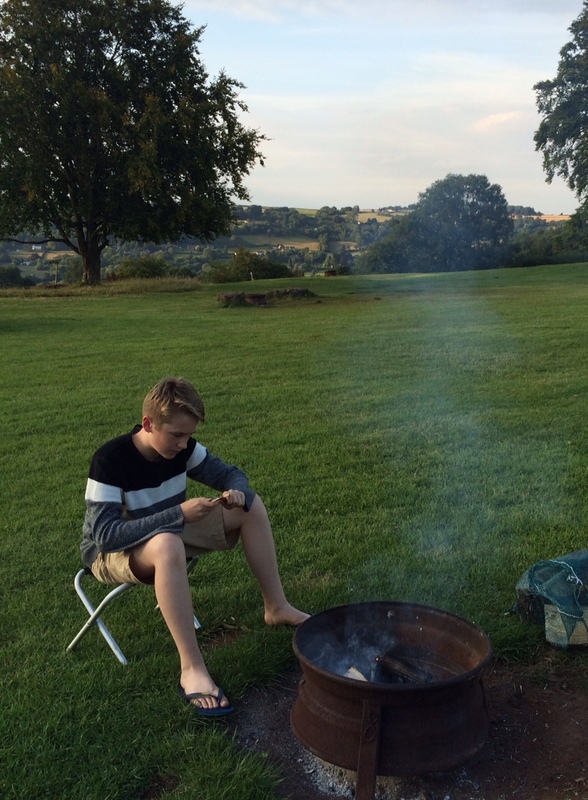 Am thinking about starting to camping again, after a long break since our sons reached teenage years – turned out that spending our annual holiday in a tent with two teenage boys just didn’t feel like a holiday! Feel it will be different now we’re two again. Ha ha, yes, I can see a time in the not too distant future when it’ll be no fun for us at all. I did have a little fantasy about a camper van and just me and my husband at one point. Thank you Amy. Yes, there is a lot to do. But not in this rain!